Confession: I am not a chain person. You may be surprised by this (read: you’re not at all surprised). I avoid chains like the plague. But when in Rome, or Poughkeepsie, as in my case, sometimes you gotta splurge. I ordered the Red Robin Gourmet Cheeseburger with a bottomless plate of fries, while my partner tried a whiskey chicken wrap of some sort. The hamburger was delicious. 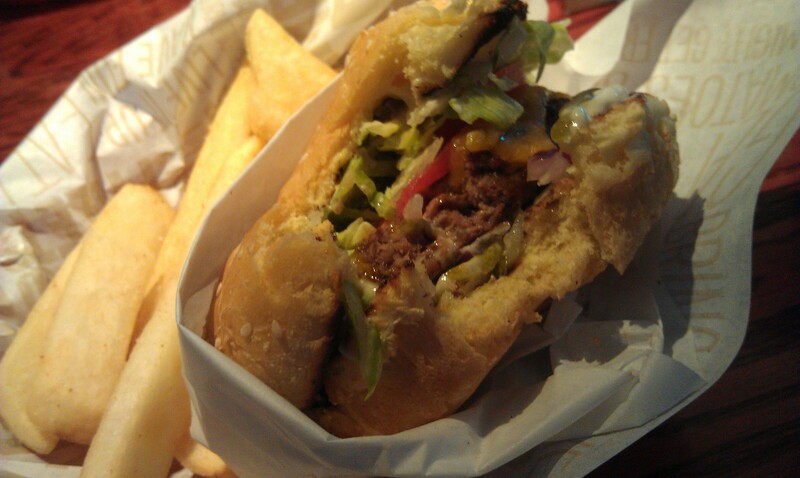 A delectable combination of mayonnaise, beef, cheese, onion, pickles, and lettuce on a squishy bun. It tasted exactly like a Whopper, but better. I wouldn’t recommend the tasteless steak fries (which my dining partner heartily decried). If you’re in Poughkeepsie and every other restaurant is closed–which may be the case if it’s Sunday–do try Red Robin. The burgers won’t disappoint.